"A Conversation on How to Write Training Materials Faster, Stronger & Better"
Many people have a fear of writing, and some who should don't. To stay competitive, you've got to be constantly polishing your sword. Don't miss this opportunity to gain insights and techniques from Lynda McDaniel that help you do your best work. Lynda McDaniel has coached me and truly made a difference. Even with a strong writer, Lynda's insights and guidance can truly bring out the best in you. She inspires and empowers you to do your best and most creative work." Whatever you write says a lot about you - to your employer, colleagues, clients, and potential clients and employers. Over time, those skills can decay. This session will be part presentation and part conversation. In it, you will gain new skills and insights, but also have the opportunity to engage in an interactive conversation that will allow Lynda to tailor her talk to what we need most. Why spending too much time trying to write a perfect first draft is self-sabotaging. 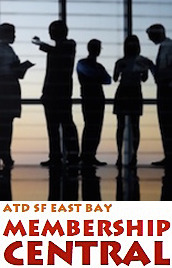 Understand the writing truism "less is more"
If you want to learn how to be more logical, engaging, accurate, organized, relevant, and memorable in your writing, join Lynda and all the friendly people who attend the Mount Diablo ASTD chapter Speaker's Dinner at the Club. You're invited and you'll be glad you came. We look forward to seeing you on the 18th. Register now! Lynda McDaniel founded The Book Catalysts in 2011 with longtime colleague Virginia McCullough. Together they help clients realize their dreams of writing and publishing books to boost their careers and business. In addition, Lynda founded the Association of Creative Business Writing in 2009 to “share the fruits of her life” as a professional writer, journalist, author, and storyteller. She offers business-writing webinars, workshops, and assessments to teach writing and storytelling skills that gain undefined and retain undefined clients. Clients for her coaching and training include executives and staff from Microsoft, T-Mobile, Boeing, Del Monte, Citibank, Graybar Electric, Wells Fargo Bank, U.S. Small Business Administration, City of Seattle, University of Washington, University of Notre Dame, Stanford University, YMCA, among others. Lynda has written 1,000 articles for major publications and a dozen books, including her award-winning books, Words at Work and Contemporary Hawaiian Woodworkers. Major publications include Southern Living, Country Living, Yoga Journal, American Style, Law & Politics, Associations Now, Atlanta Journal-Constitution, Seattle Post-Intelligencer, guideposts.com, and washingtonpost.com. With her longtime colleague Virginia McCullough, Lynda is writing the first draft of The Book Catalysts’ step-by-step book-writing kit undefined due out this fall. To learn more about Lynda's previous release, Words At Work, refer to the chapter's Book Club on this site.